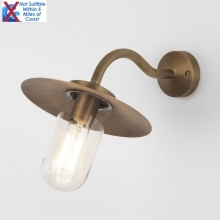 This bold double wall light features elegantly curved arms and a sleek, ridged central sconce all finished in bronze. The fitting comes complete with Ivory shades to add a touch of modern glamour and enhance any contemporary interior. The Ivory shades shown in image are manufactured using 100% silk.